This Sunday's menu is feeling the love from several Latin American countries--a little from Mexico, a bit from Puerto Rico, and some from Cuba. Since the origins of the Tres Leches Cake have been traced to many Latino culinary cultures, I thought it would be a perfect finish to this meal. 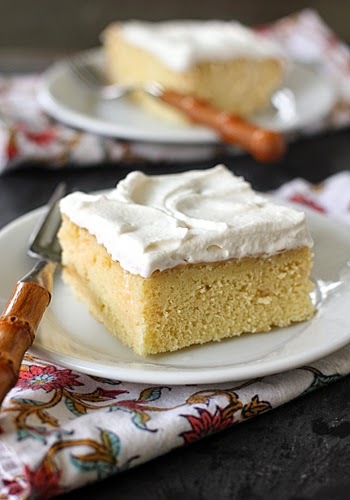 Tres Leches Cake is a sponge cake that is soaked with a mixture of "three milks" (sweetened condensed milk, heavy cream, and evaporated milk). Some recipes call for just egg whites, but this recipe uses whole eggs, which makes for a sturdier, but still light in texture cake that can stand up to the milk mixture without becoming over saturated and soggy. This recipe also takes it one step further by first reducing the condensed milk for a concentrated sugar taste and a thicker texture. I also like to add a bit of rum to the milk mixture for a bit of spice that compliments the cinnamon in the batter. The cake does need to soak for at least three hours, but preferably overnight. The topping is a simple whipped cream mixture. You might not think that it is enough to frost the top of the entire cake, but all you need is a little cream layer before sinking your fork into the creamy, soaked cake. Once assembled, the cake can be made and kept in the refrigerator for up to three days. Any make-ahead component to a Sunday meal is a bonus for me. Pour the condensed milk in a large microwave-safe bowl and cover tightly with a sheet of plastic wrap. Microwave on low power, stirring and replacing the plastic every 3 to 5 minutes, until slightly darkened and thickened, 9 to 15 minutes. Remove from the microwave and slowly whisk in the evaporated milk, cream, rum, and vanilla. Set aside and let cool to room temperature. Adjust the oven rack to middle position and preheat to 325º F. Grease and flour a 13 x 9-inch baking pan; set aside. In a medium bowl, whisk together the flour, baking powder, salt, and cinnamon. In a small saucepan, heat the butter and milk together over low heat just until the butter has melted; set aside off heat. With an electric mixer on medium speed, beat the eggs in a large bowl for 30 seconds, then slowly add the sugar until incorporated. Increase the speed to medium-high and beat until the egg mixture is thick and glossy, 5 to 7 minutes. Reduce the speed to low and slowly mix in the melted butter mixture and vanilla. Add the flour mixture in three additions, scraping down the bowl as necessary, then mix on medium speed until fully incorporated, about 30 seconds. Pour the batter into the prepared pan and bake until a toothpick in the center comes out clean, 35-40 minutes. Transfer the cake to a wire rack and let cool for 10 minutes. Using a skewer, poke holes at 1/2-inch intervals in the top of the cake. Slowly pour the milk mixture over the cake until completely absorbed. Let sit at room temperature for 15 minutes, then refrigerate uncovered for 3 hours or up to 24 hours. Remove the cake from the refrigerator for 30 minutes before serving. Using a whisk or electric mixer, beat the cream, corn syrup, and vanilla to soft peaks. Frost the cake with the whipped cream. Slice into squares and serve. (Assembled cake can be refrigerated for up to 3 days.) Enjoy! Thanks for visiting my blog! 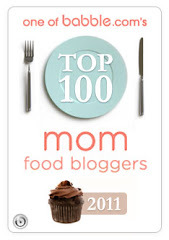 I love hearing from family, friends, and bloggers, so please leave a comment. Happy cooking! I am passionate about food, so I started this site to share recipes, try new ones and to create a master list of the ones I love. Subscribe today and never miss a delicious recipe!